The countdown is ON for sure. 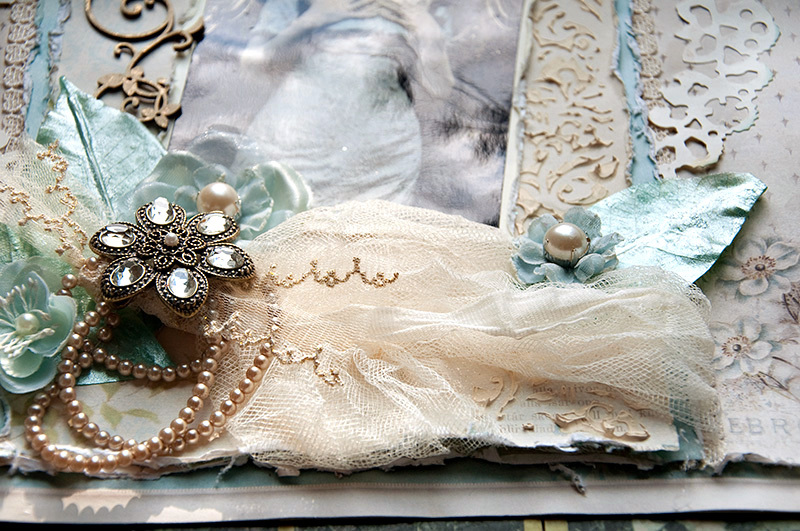 Scraps of Elegance. Please come visit on Feb 1st for our reveal and blog hop! Prizes, world renowned special Guest and so much more. habits, or literary style: 3. Scraps of Elegance Kit Club. 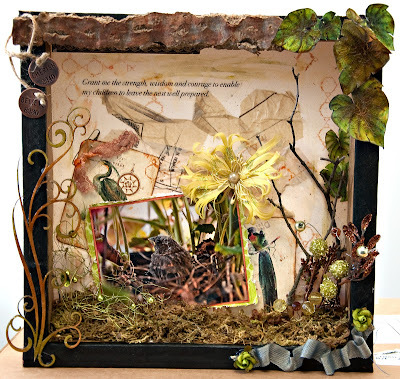 I am thrilled to announce the coming arrival of the Scraps of Darkness new sister kit club: Scraps of Elegance. The first kit will be posted on our blog Feb 1st! 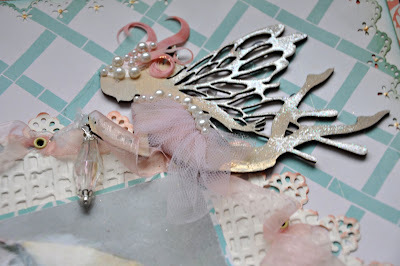 There will be prizes, a blog hop and a special guesy designer. No - it is NOT Escape Kitty. Sorry to disappoint, Kitty, with your big ego and all. 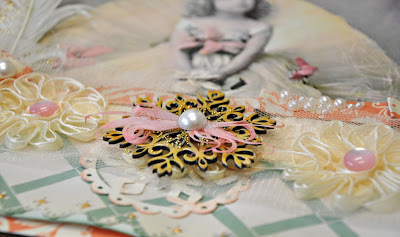 Please stop back here, sign up for my blog and try your hand at a chance to win a kit. 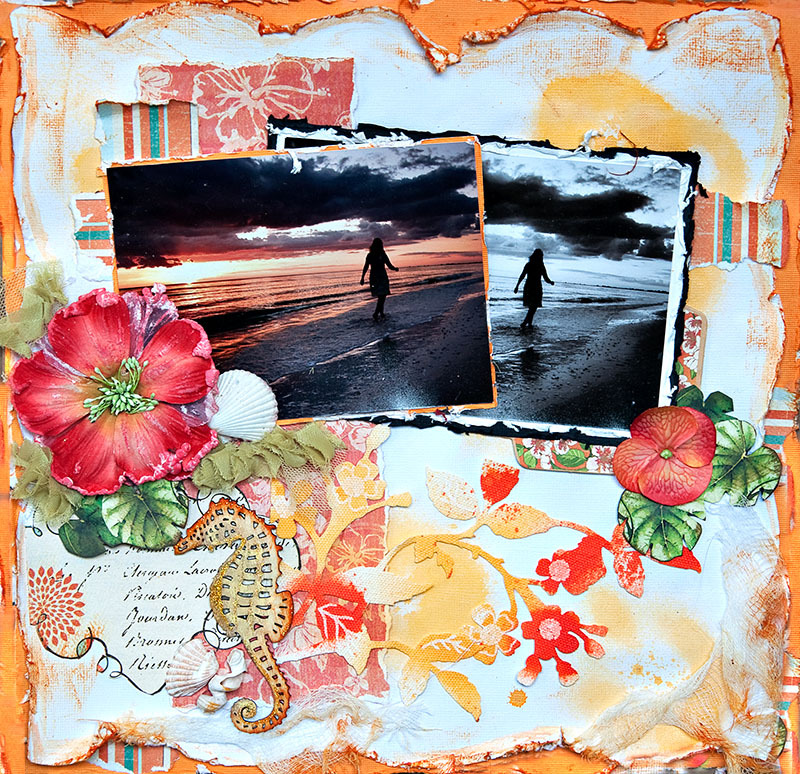 Beachy Me - created using the Scraps Of Darkness - Jan Escapes Kit. This is me on the beach in Naples, FL as a quick storm was rolling in around sunset. Makes for a dramatic sky. I do get odd looks from people on the beach when I set up the big ol triopd and start the fake walk- makes me look like I know what I am doing yet the real truth is I take about a hundred photos all experimenting with the settings on the camera. I am still learning and that means I am a major hack! But it is fun and I am happy learning and I bother no one in the process. The kit is bright and fun and warm. A much needed escape for this time of year. It's darn cold where I live - no beach, just skiing. 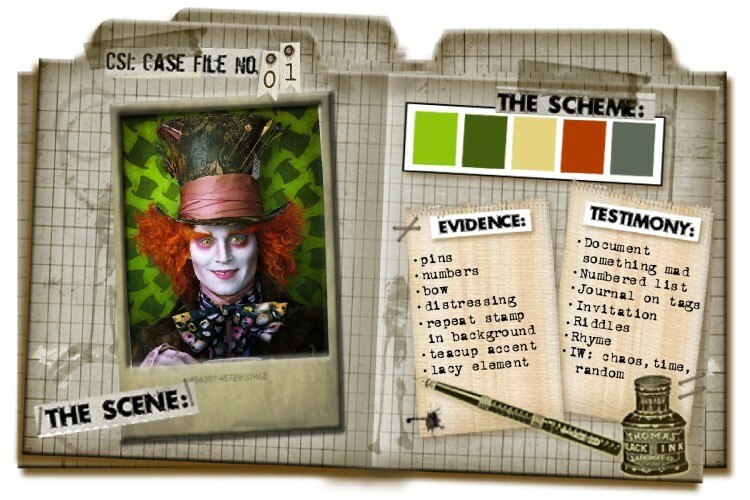 These were created for the new CSI- Color, Stories, Inspiration website. 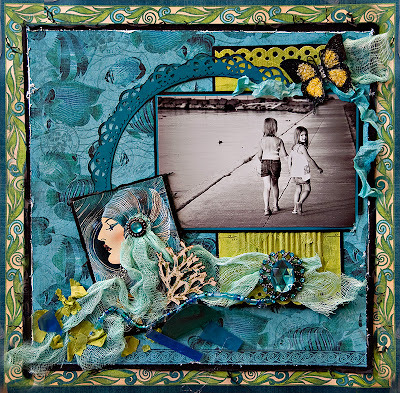 The color palette is shown above. 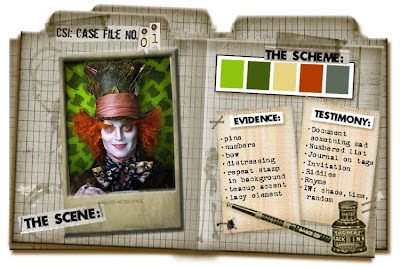 In additional to using all five colors, you ned to pick two items from the evidence list and one from the testimony. 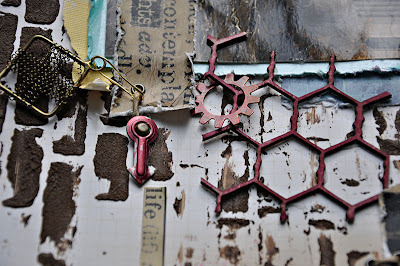 I am having fun with CSI so I decided to do two with the same color palette - one a little industrial and one more girly feminine. I took this photo in 2010 in downtown Rochester on my lunch hour. 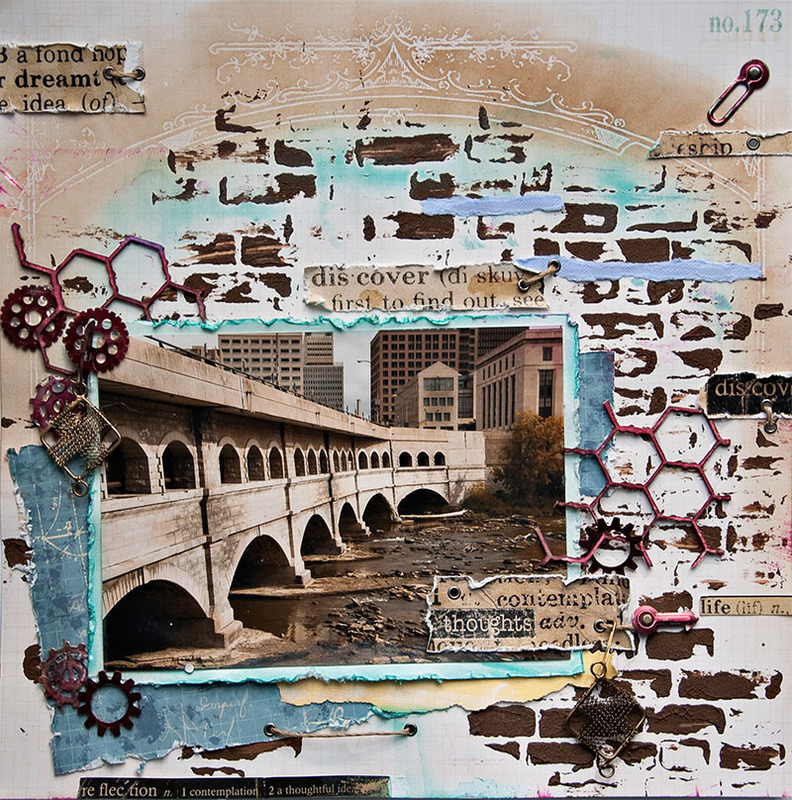 It's the Genesee River and it flows through the heart of the city. One of the items on the testimony list is a "stream of consciousness", I'm not really sure how to apply a stream of consciousness to my layout, so I decided to call my photo the "Stream of Thoughts". It's my creative twist since I was a bit confused. 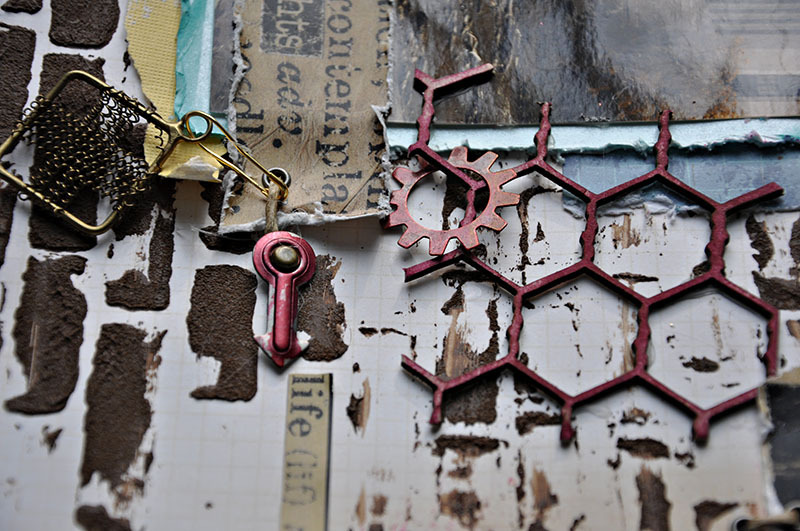 The cogs represent my mind and the Dusty Attic Chicken Wire DA0457 is tripping my mind up. 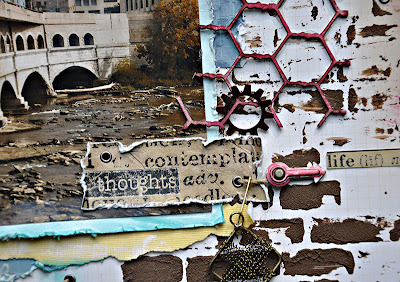 My bricks are made using the Prima brick mask and some ceramic stucco that has brown acrylic paint added. I had my nieces over night recently. When they got up, Aunt Jennifer had some dress up costumes all ready for some photography -a surprise for their mom before she came to pick them up. I also have this really cool antique sled that I bought from the neighbor's yard sale. She said it was hers from childhood and reckoned it was 80 such years old. 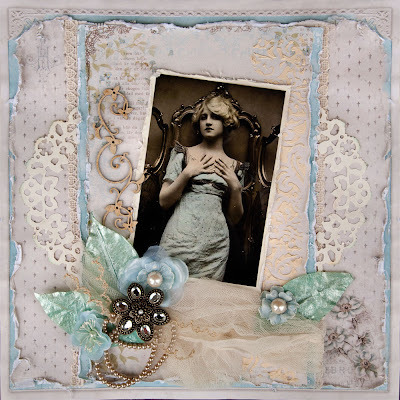 My colors from the palette are subtle but they are there. 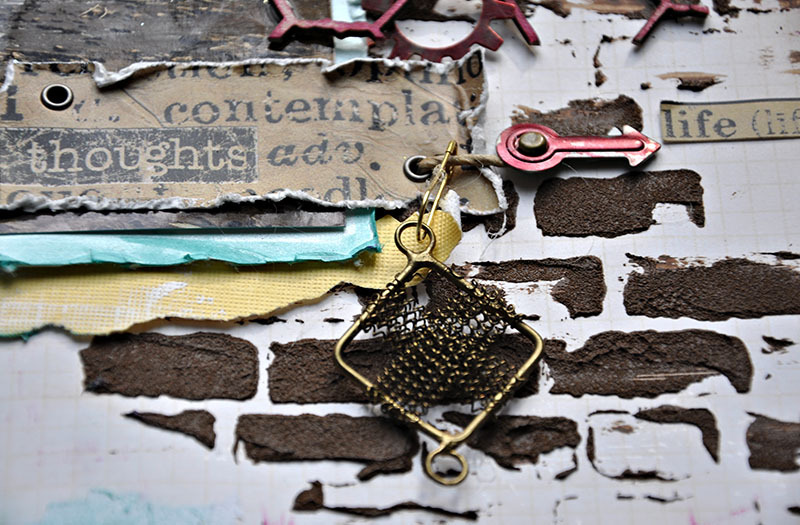 This is more of a close up of the detail and the really wonderful Dusty Attic Wrought Iron Fence DA0176. Watch the video and see if the powerful lyrics don't make you a little sad. 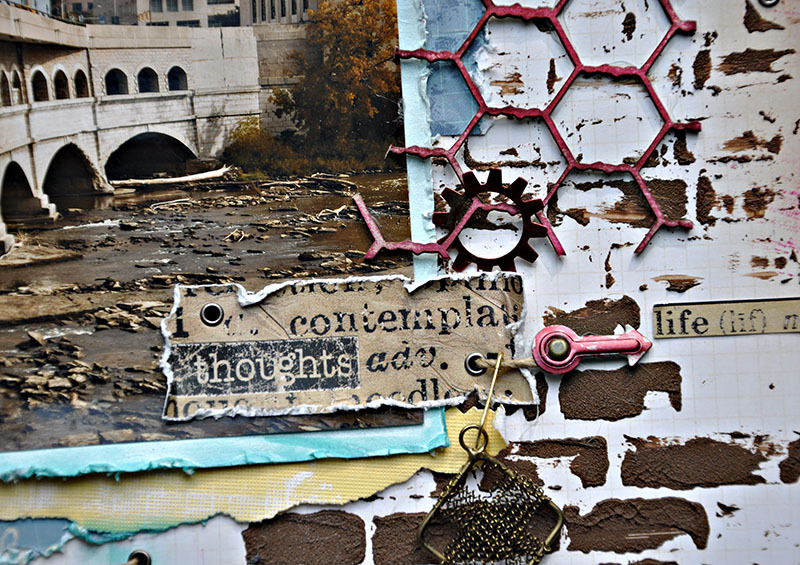 We are scrappers and artists trying to reclaim the past, capture the present, and make memories live on in our work. It's our creative way of keeping the tears of regret and sadness away and replace with joy, love, peace and fond memories. Today, Kodak filed Chapter 11 Bankruptcy. Why bring this up in a blog dedicated to scrapping? Because every scrapper owes a debt of gratitude to Kodak. 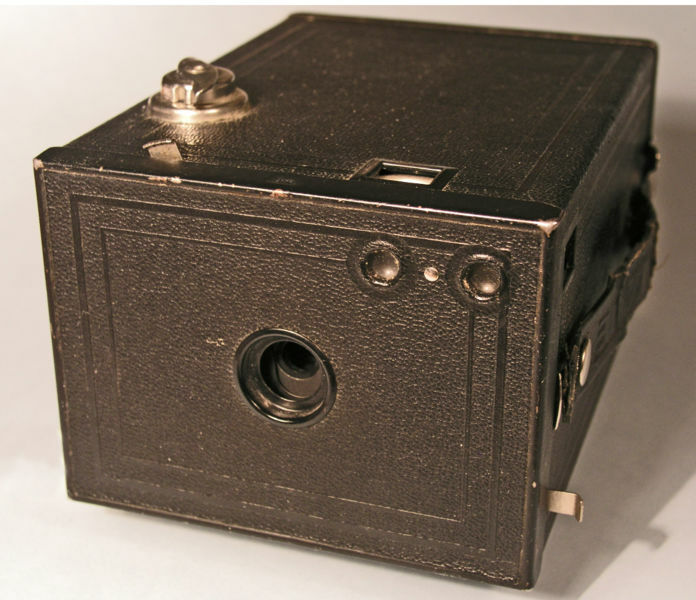 Without Kodak's innovative, photographic history, none of us would be scrapping. I live in Rochester, the hometown of Kodak. I'd make a bet that almost every family in Rochester has had some ties with employment at Kodak: a relative, a friend, a neighbor, maybe a business connection or a vendor, but certainly someone. For me? Several relatives worked at Kodak: my grandma, some aunts, uncles, my husband. Our family still has a Kodak Brownie Camera- yeah it's old and it's got some images still on it, just frozen in time for the last 80 years. This chapter in Kodak's life is sad indeed and I did have some teary thoughts on the drive to work today as our local radio station played the Kodak Theme song from many years ago, "The Times of Your Life". The song played. The memories flooded. Music can do that. The song may be from another generation, but the words and meaning of the song remain timeless and appropriately directed toward my beloved hobby. Oddly, this song will become pertinent and meaningful to everyone at some point in life, so let's scrap our little hearts out and capture our memories today. This is the first time I can say I've been thrilled to be "watched" and under surveillance. 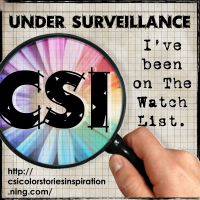 I'm On the "Watch List" at CSI: Color, Stories, Inspiration for Case File #1. 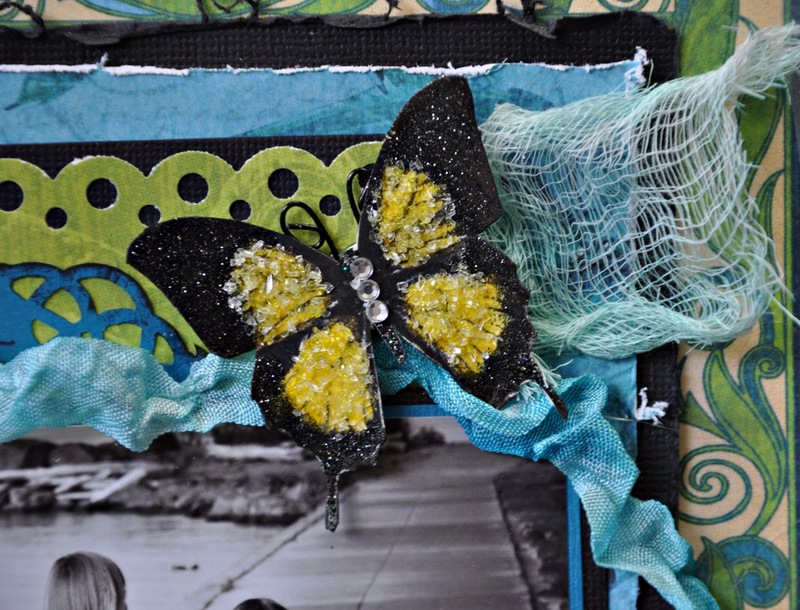 This is a fun, innovative new color challenge with a few twists added. Here is the color palette and particulars. You need to incorporate two elements from the evidence list and one from the testimony list. I created this reverse canvas with the challenge palette in mind, using the Scraps Of Darkness Jan Kit - Escape. This is my "Fly From The Nest" canvas that features my baby bird photo. My quote: "Grant me the strength, wisdom and courage to enable my children to leave the nest well prepared." My husband suggested I stop the quote at the "leave the nest part" - no need to continue - just get the kids out someday. He's such a kidder that one is! Summer 2010 I placed a hanging geranium planter from my front porch. A mama bird proceeded to think this hanging plant was a dang cool place for a nest - nice homey feel I guess. Only one egg hatched and I was officially a grandma. Proud moment for me! In order for me to see down into the nest, I had to hop on a step stool. Every morning before work, every evening after dinner, out came the step stool. A few weeks went by and I watched the baby grow and listened to his mommy holler sassy chirping words at me when I peered at her baby. We were leaving on a vacation and I had a sense that when we came back, baby and mama would be long gone so I hopped on the step stool with my Nikon and clicked some bragging baby photos. Next morning after coffee, I grabbed my step and went to check up on Junior. Mama was no where to be seen or heard - hmmmm that was very strange indeed. Junior was standing on the edge of the planter in a pensive position. Then he looked at me as if to say, "Thanks Granny" and he made his first leap of faith that sent him soaring away forever. Bye Bye Birdie! Now don't be getting all excited on me....I still have a few teens left at home so my hubby and I are not empty nesters yet - but I do know this particular nest is empty. For a brief few weeks, I had me a sweet lil grandbaby of sorts. All you grandparents out there, hug and enjoy your little people because it's only a matter of time before they grow and fly the coop, just like Junior. This reverse canvas is a hope and a prayer that I do my very best to prepare my kids and teach them well. You can find the rest of the "suspects" and their creations here at CSI: Color,Stories, Inspiration . 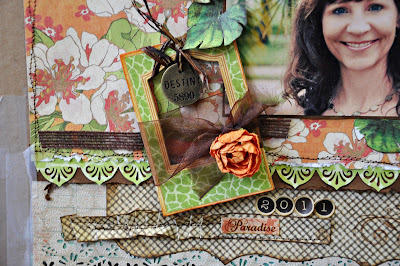 Welcome to the January Reveal for the Escape Kit from Scraps of Darkness. Reveal day is filled with enough excitement for most of us however we have one big announcement at Scraps Of Darkness to put you on the edge of your seats. We are expecting a new baby! We (not me). No, no one at Scraps of Darkness is pregnant, that we know of, but SOD is getting a new little sister. 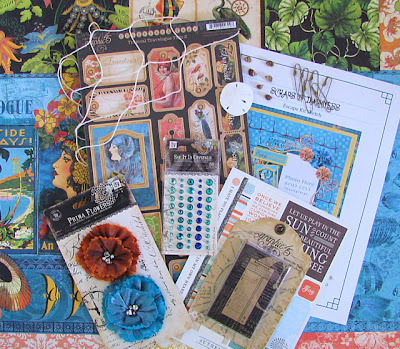 On Feb 1st, we reveal a new line of kits, Scraps Of Elegance. 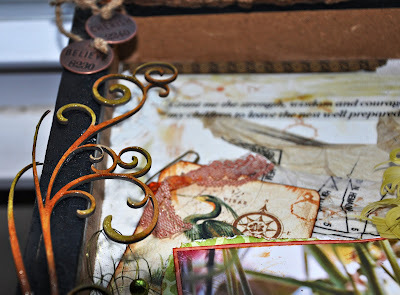 Different than the SOD line but coordinated by the same talented folks who prepare the Scraps Of Darkness kit so you know it will be the highest quality, most extraordinary assemblage of goodies. We are honored to have a very special guest to help with the launching of the kit. 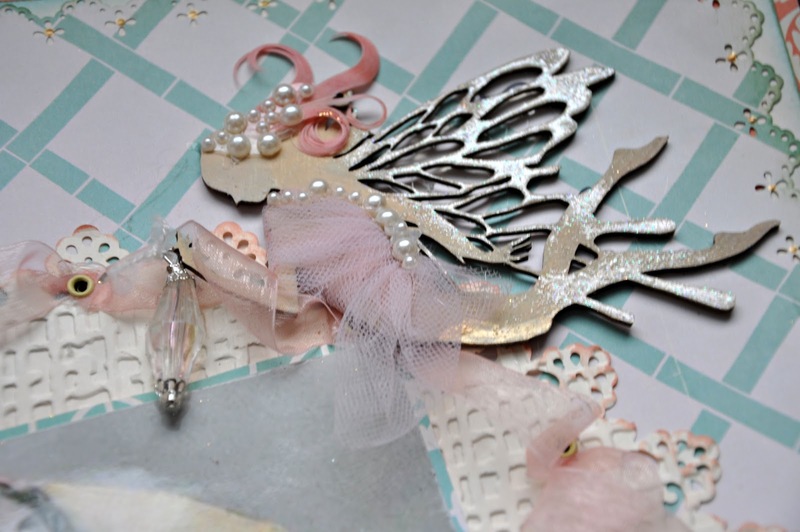 Ohhhhhh I can't wait to see what she creates with the Scraps Of Elegance kit. 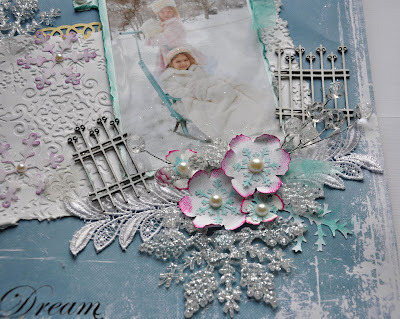 We are also having a blog hop with prizes on Feb 1st to welcome the new arrival. So join us for the reveal and the fun all starting Feb 1st. Oh how I love reveal day! The excitement of showing off the new kit from Scraps Of Darkness. Well it's here and it's filled with warm tropical delights to take your mind off the cold stark winter. At least it's cold and stark outdoors where I live. Inside? Not a chance. 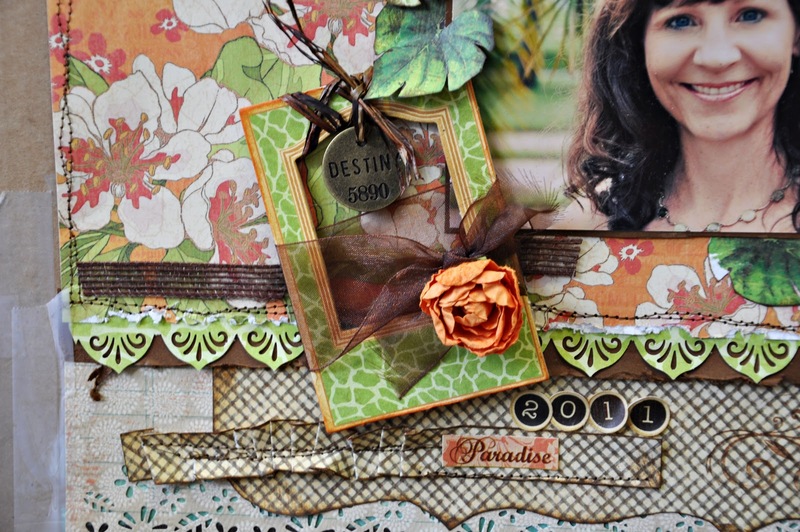 This kit brings the bold colors of the tropics right into your creative area. So with that, lets show you what I did with the kit? I took this photo of my nieces in Sept. 2011. We had some laughs that day getting them to cooperate. But guess what? I realized Aunt Jennifer can only be in control of her camera and the rest is up to the mood of the subjects I am shooting. A simple "no, No NOOOOOO, don't look at me, just walk" and my sweet niece could not refuse to turn around and look at me. Every parent knows what I am talking about. A "no" is really a dare. So this dare was captured as such and I love it! It could not be a cuter picture if I'd actually told her to turn and look. 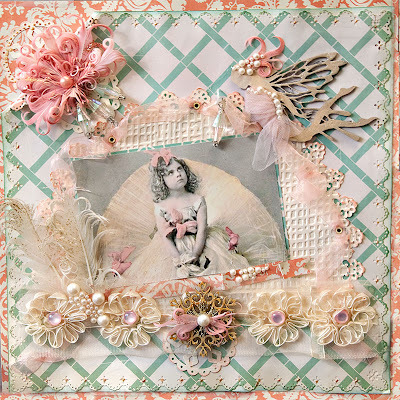 This was based on the wonderful creative sketch of Suepup, Charlotte Jenkins and features the G45 Tropical Travelogue paper line. 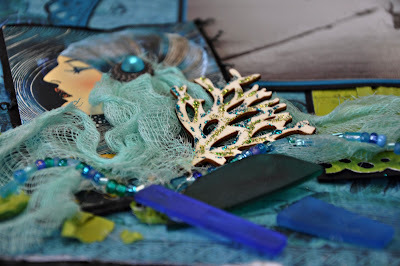 I used some sea glass from the January Kit and some cheesecloth spritzed with Tattered Angels Glimmermist in Bahama Blue. I added the Pink Paislee wood shapes for accent and stickled them. The green paper pieces are rips off the green cardboard on the right of the lady. t was a cool piece of cardboard that came in some perfume I received for Christmas. The cardboard packaging was every bit as cool as the fragrance. This is a photo of me in our favorite vacation paradise, Naples Florida, July 2011. The kit was perfect for the photo and the feeling I get when I am there on vacation. 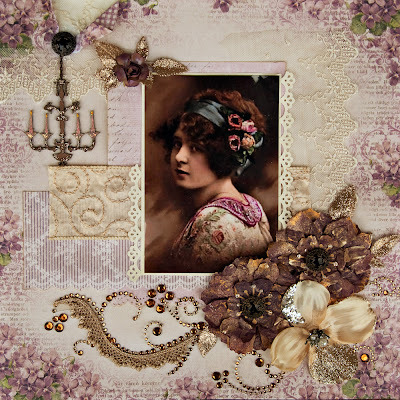 Here I used a Dusty Attic Decorative trim Set DA0435 piece that was inked with Tim Holtz vintage photo distress ink, then I used a little Tim Holtz Distress embossing powders in Vintage photo and Scattered Straw. 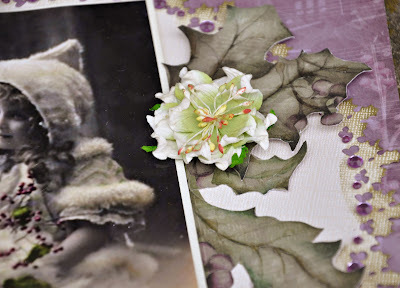 This is a photo that I used from Magical Moonlight Free Studios. 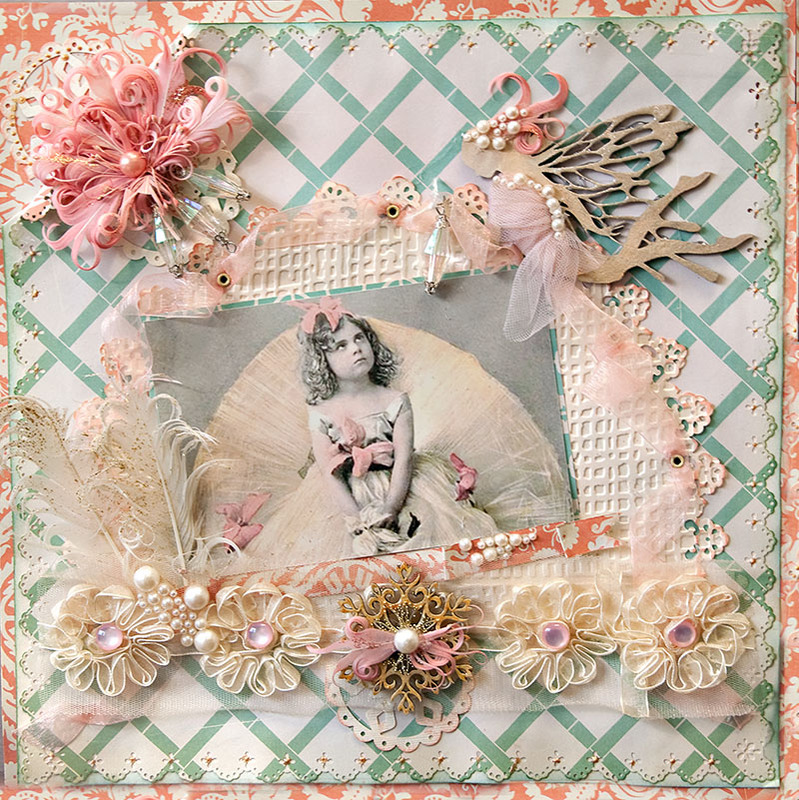 This layout features the Pink Paislee Nantucket paper collection. 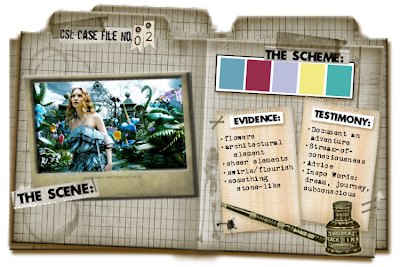 This is a reverse canvas that I created with the new CSI Case file #1 in mind. 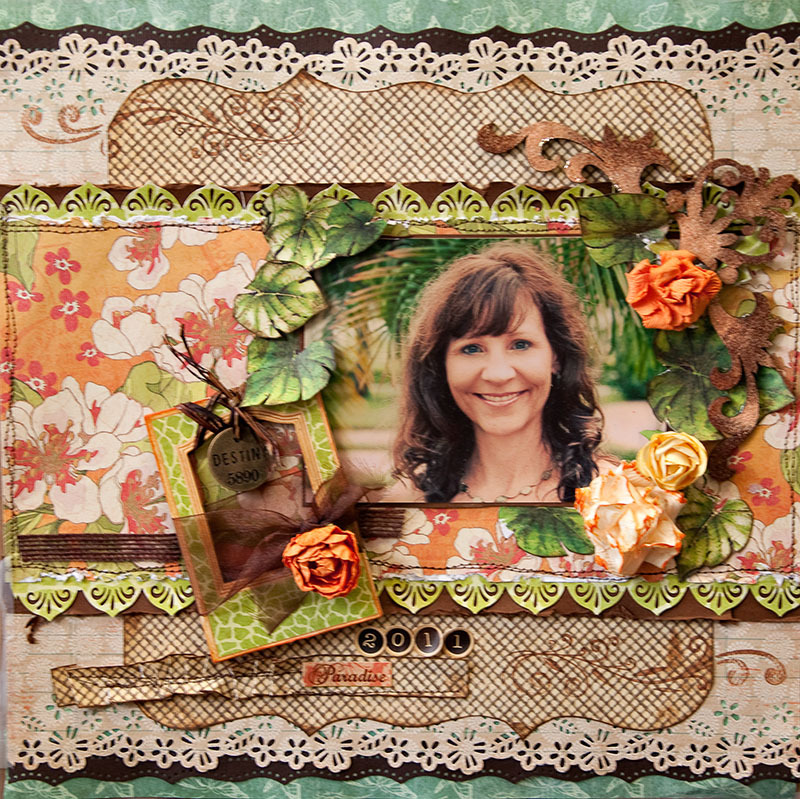 This is a Dusty Attic Scroll Border #1 piece I finished in Tim Holtz Peeled Paint and Spiced Marmalade then covered with Crackle Accents. 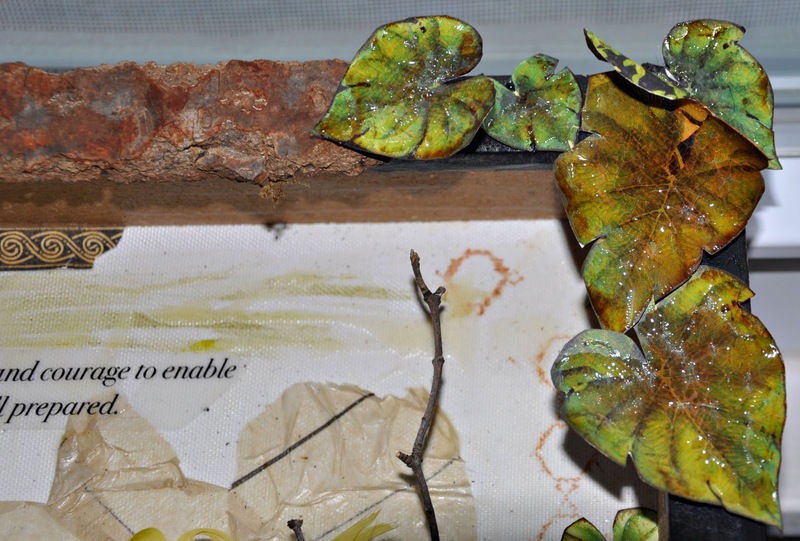 These are leaves cut from the G45 Tropical Travelogue papers and coated with crackle accents. That is a piece of bark from my woodpile. I stuck it in the microwave for 2 min to kill any crawling stuff - ick. Then I added a touch of Tim Holtz Spiced Marmalade to the bark. 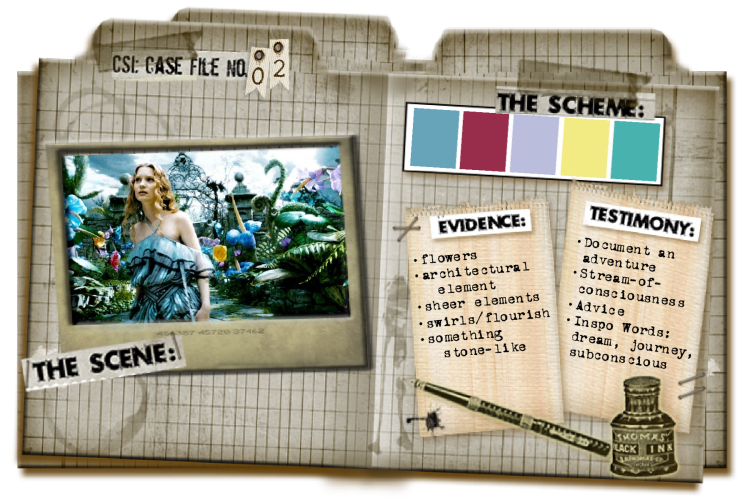 Here is the CSI -Case file #1 with color palette and evidence list to use. You can find all the Dusty Attic goodies that I reference above here . You can also see the rest of the Creative Team Kit reveals HERE. Thanks for looking and please join us Feb 1st. Here is another layout I made with the Pion Design papers. Oh I am in love with the softness of the papers. 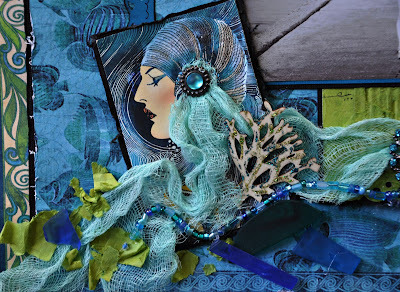 The photo is from Graphics Fairy called One Beauty. 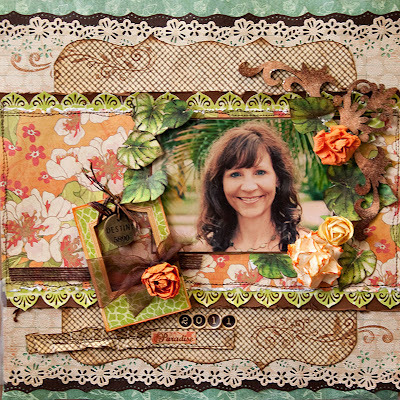 I used the Dusty Attic Sweet Pea border on the side of the photo. 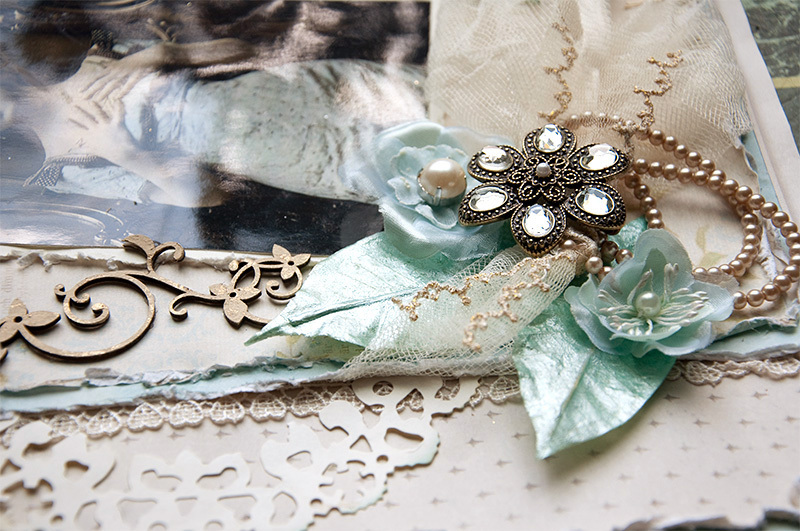 The broach was a piece of jewelry I bought with a 50% off coupon and the pearls were an even better find at 50 cents. Now I have to admit I am not a jeweler so I just thought the pearls were supposed to be in a little triple loop like this because they were packaged this way. When I opened the package, they sprang open into one large strand. My little heart sank -what the heck! What happened to my cool and beautiful pearls? So I figured out that I needed to wind them and twist them up again. Sheesh, I'll tell ya. The things I've got to learn the hard way. Here are the close-ups of my bridal netting wrap, Dusty Attic, and bargain jewels. This is my layout called Wondering Gaze. Finally got my hands on the delicious Pion Design paper that simply wants to scrap itself. 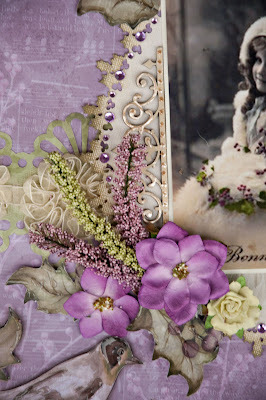 I used the Pion Fairytale of Spring (Violet) mixed with the Studio of Memories ( Rose). The photo was from the Graphics Fairy - and the chandelier is from Dusty Attic - all gussied up with stickles. I think the chandelier was just the most perfect finishing touch here. It's being held up with the same button that is in the center of the purple flowers. 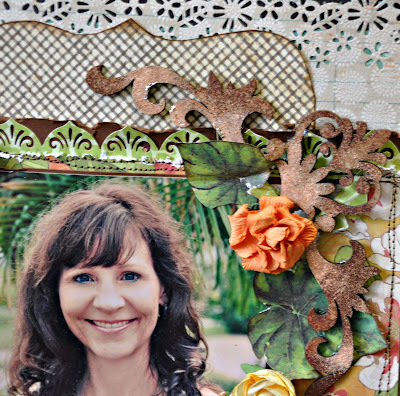 The large flowers are from paper bags that I misted. I used the Tim Holtz tattered Floral die on some brown paper packaging from my Scraps Of Darkness Kit club and misted away till they were a perfect shade of whatever you'd call it purple. 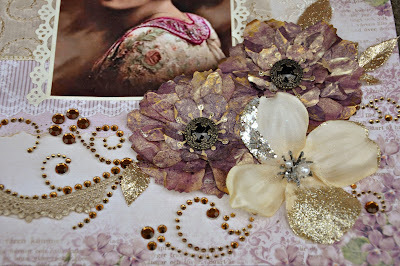 Then I covered with a little bit of Perfect Pearls Gold mist. I did finish by rubbing some gold wax rub all over the petals. 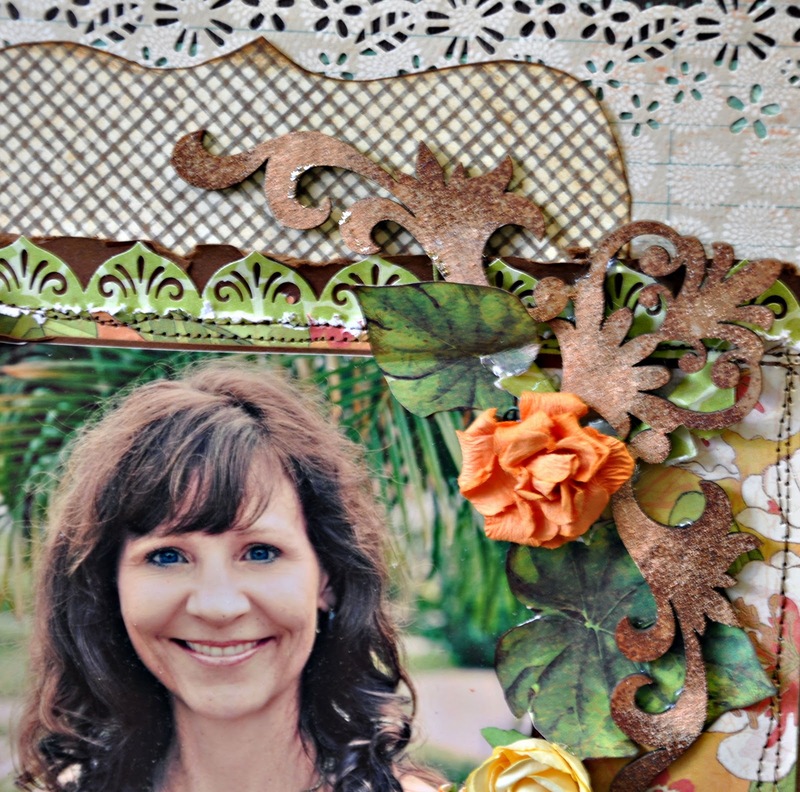 The center of the flowers is the McGill starburst punch and a black vintage looking button that was on clearance at Joanns for 50 cents. Gosh I love a bargain. 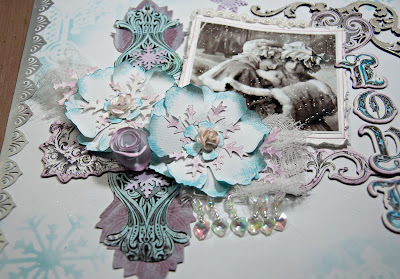 But oh my goodness, those Pion papers I used - ohhhhhh they make me tear up with their beauty. This is one is called Winter Innocence and was created using the Scraps of Darkness Kit for December -Winter's Eve. 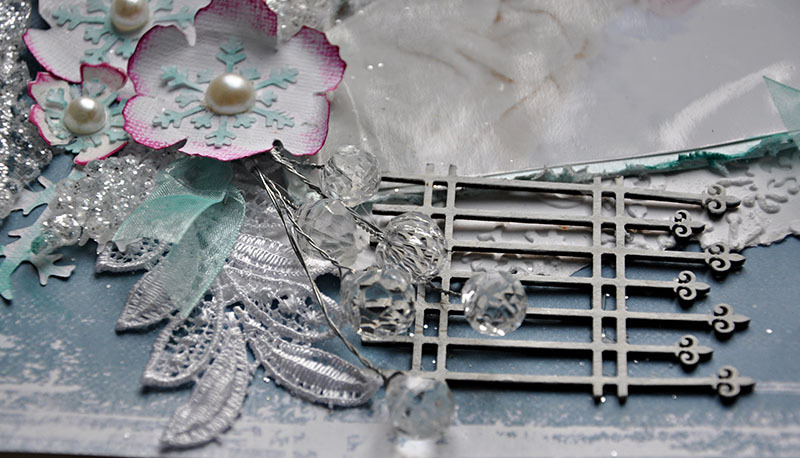 The papers are the wonderful Creative Imaginations Winter Song collection in Peaceful and Songbird. I did a but of fussy cutting here on the leaves then used some glossy accents to give the leaves some definition. This photo was obtained from Creative Souls. 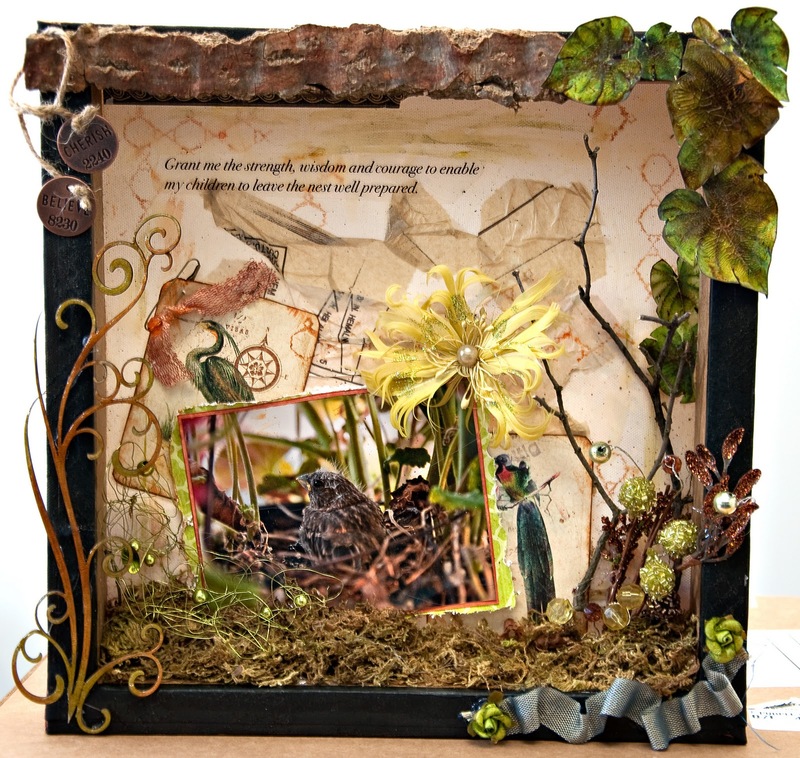 I also have some wonderful Dusty Attic on the side of the photo and the Sweet Pea border at the bottom. The long spiky flowers are Kaisercraft -Chanteuse Collection Posies that I misted with some Tattered Angels chalkboard mist in Concord. 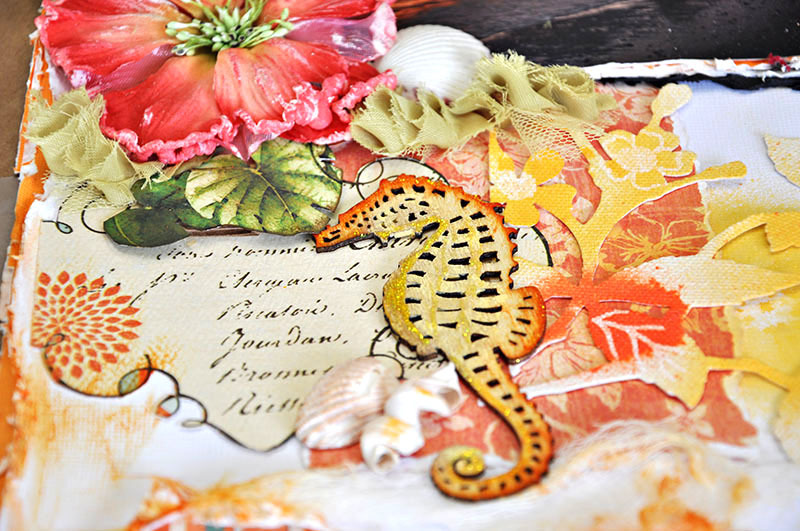 This is an image I found from Magical Moonlight Studios Free Images. I thought the image would fit my Winter's Eve Flowers wonderfully. You can watch the video below. 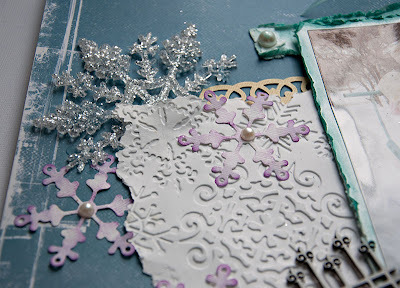 The page was created using the Scraps Of Darkness Dec 11 Kit - Winter's Eve. 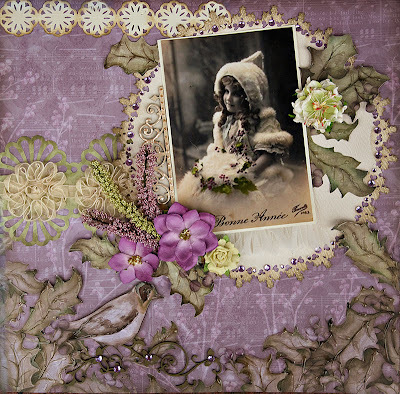 I have touches of the Bo Bunny Enchanted paper and a little of the Creative Imaginations Winter Song -Holly. I completed the page with the Dusty Attic Baroque Corner DA0543 and applied Shimmerz Enamlez -Sparkliscious. A blast of the heat gun and the Shimmerz looks like crystal. 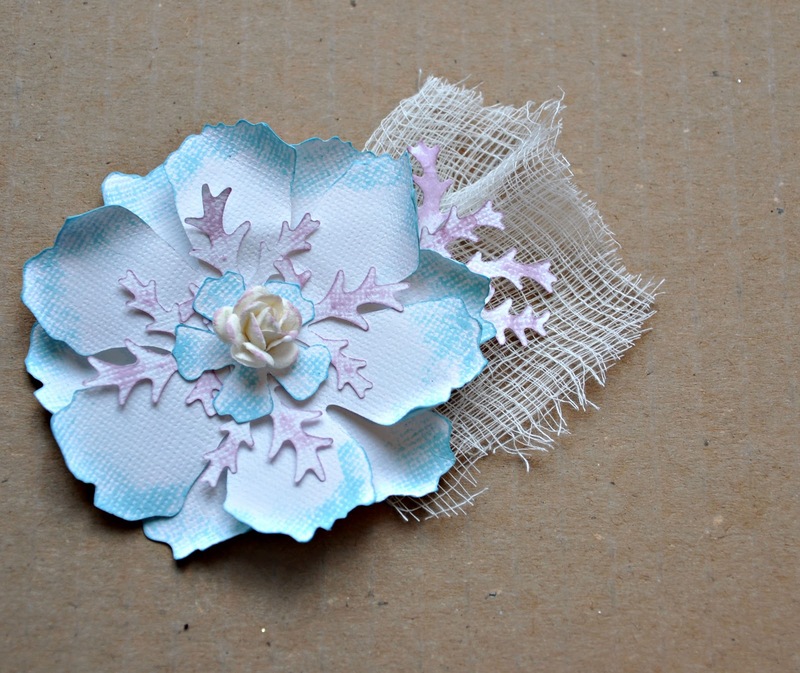 Here is the flower. 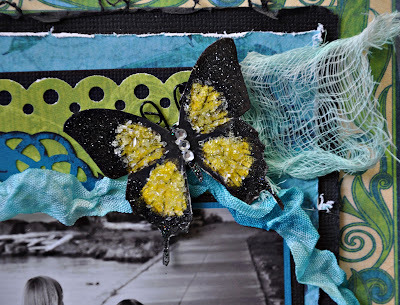 I used the Tim Holtz Tattered Florals die and the Heartfelt Creations Bella Rose die, some inks and cheesecloth. I finished with a tiny flower centerpiece. Cheesecloth can be found in a number of places; fabric stores packaged or cut-by-the-yard, craft stores in a pre-packaged form, and even in many grocery stores near the backing section - pre-packaged. 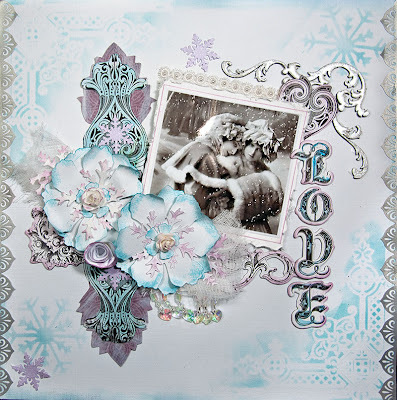 I painted the Bo Bunny chipboard LOVE letters with Lindy's Stamp Gang Magicals in Blue Hawaiian. These came in a Scraps Of Darkness color add-on a few months back. I love the color add-on because the products encourage me to try new techniques I probably would not seek out on my own. 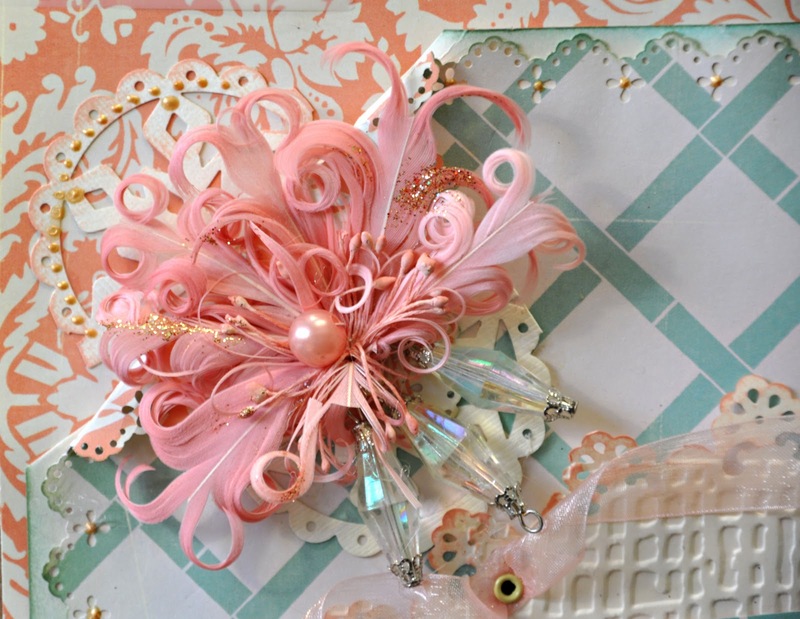 I included a rolled flower that I learned from Rachiebabe ( Rachelle Sigurdson). You can see it here. Thanks Rachelle. 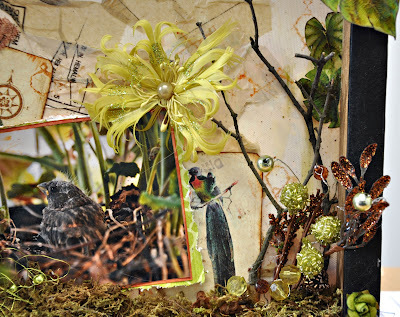 Thanks for looking and have a wonderful, creative day.